These Chocolate Muffins are a tried and tested bakery-style recipe! Learn the tricks to moist, delicious, and flavorful chocolate muffins. 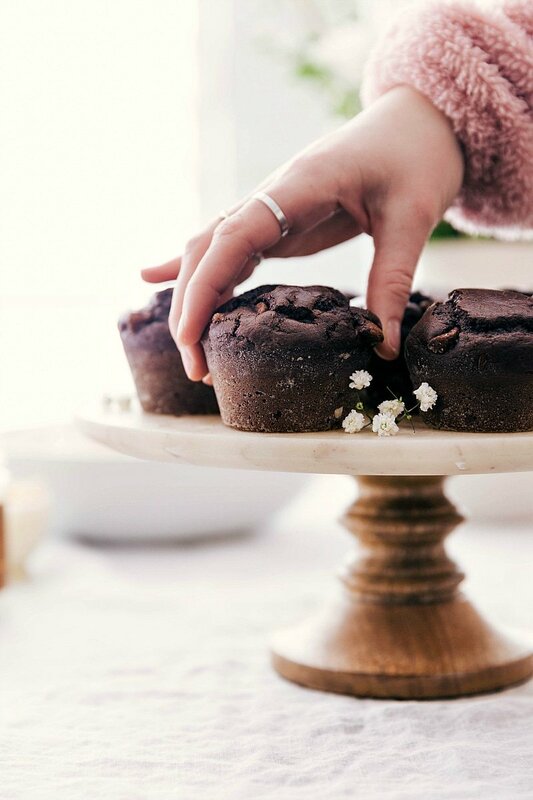 So, while these aren’t the typical healthy (ish) muffins you’ll find on my site, I’m so excited to finally share a bakery-style, moist & delicious, double chocolate muffin recipe with you all. I’ve been slowly tweaking and working at this recipe for a few months and never got it up in time for the holiday season, so bear with me as I share these amidst all the healthy meals/treats you’re probably hoping to find this January. 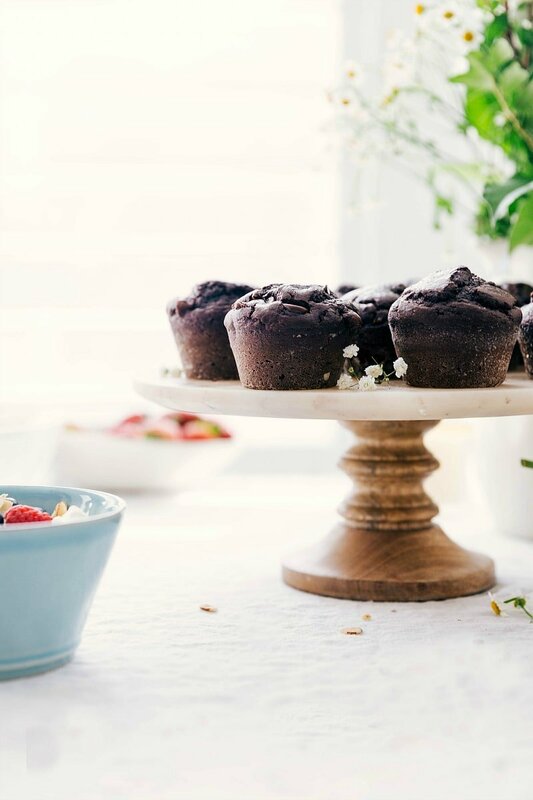 OR make these healthy-ish chocolate banana muffins in the meantime! 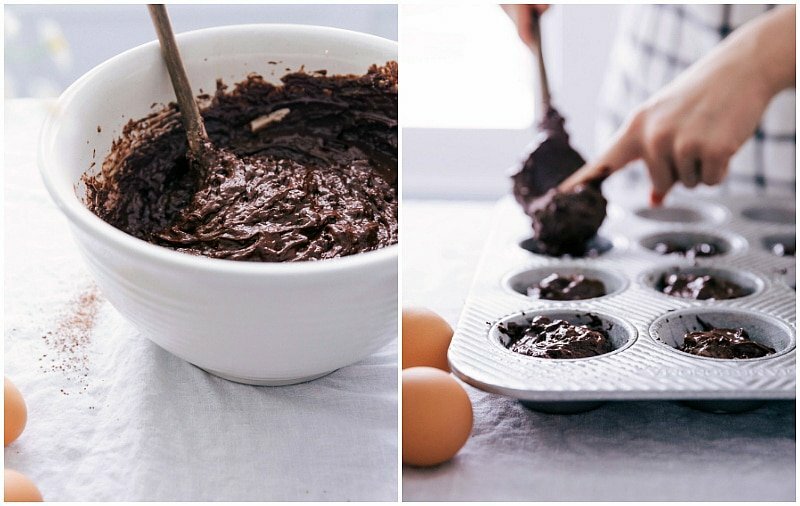 How do you make the best chocolate muffins? Sift dry ingredients: the flour, cocoa powders, baking agents, and salt all get sifted together into a large bowl. Then you’ll toss in the chocolate chips. By adding the chocolate chips to the dry ingredients, you’ll get an even dispersion of chips throughout the muffins. Beat wet ingredients: the eggs and both sugars get beat together until thickened. Next the oil and butter are slowly streamed in while beating. Finally you’ll mix in the sour cream, buttermilk, and vanilla extract. Combine wet and dry: add the dry ingredients to the wet and beat until JUST combined. Over-mixing causes an activation of the gluten in the flour which will result in denser/drier muffins. 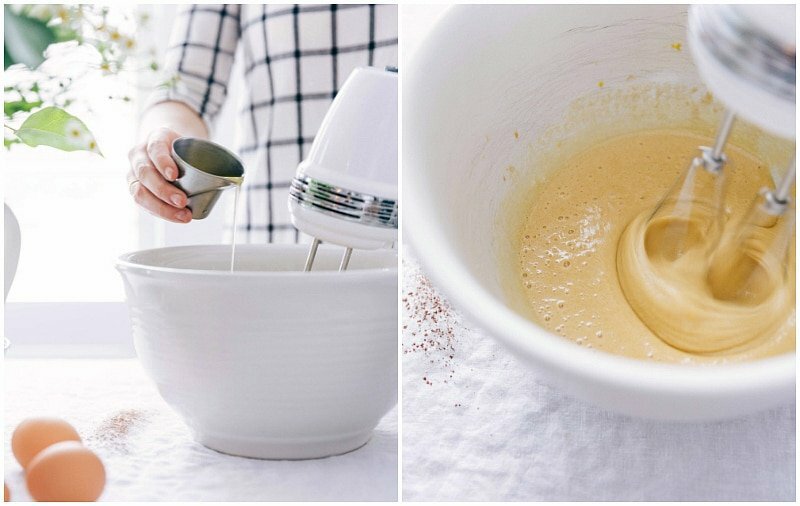 Bake: fill greased and lightly floured muffin tins with the batter and bake! The muffins are done when a toothpick inserted in the center comes out clean or with moist crumbs. Use GOOD cocoa powder: the better the cocoa powder you use, the better these muffins turn out! While natural cocoa powder does work great in these muffins, dutch process cocoa is going to give you the most flavorful and moist muffins. This is my absolute FAVORITE cocoa powder. High quality chocolate: again, the better the chocolate, the better the flavor! I love ghirardelli or guittard chips OR chop up a good chocolate bar. Spoon and level flour measurement: if you pack in too much flour, you’ll get denser/drier muffins. Here’s a great video showing how to properly measure flour for this recipe. Don’t over-bake: again to avoid dry muffins, you’ll want to make sure you don’t over-bake these muffins — they can go from perfectly moist and fudgy to dry and less flavorful in just a few minutes. How do you make chocolate muffins without chocolate chips? This chocolate base of these chocolate muffins comes from a cup of cocoa powder. With that much cocoa powder you’ll get a rich, chocolatey taste without chocolate chips. While this recipe also calls for chocolate chips, they aren’t necessary; you can simply leave out the chocolate chips (no other changes needed)! Can I make recipe substitutions? Greek Yogurt: You can use greek yogurt in place of sour cream. I recommend using Greek Gods Whole Fat Honey Vanilla Yogurt (it’s AMAZING). 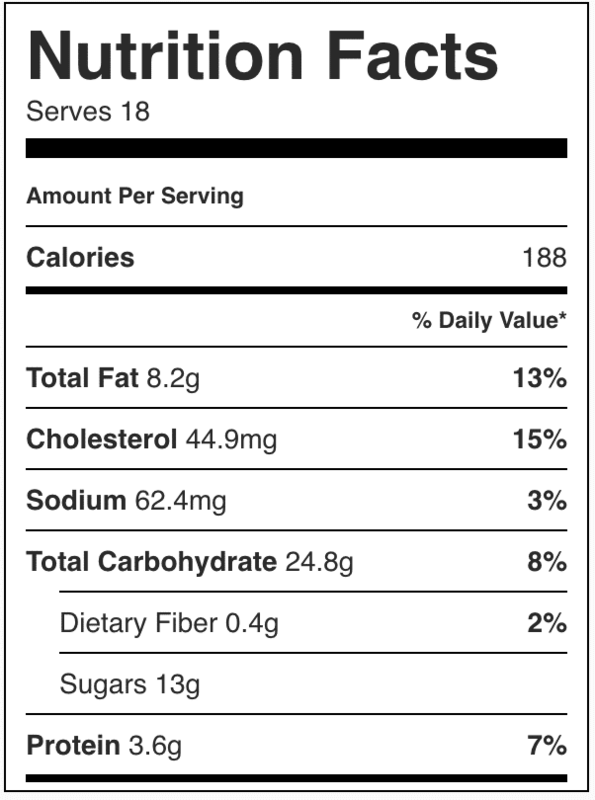 If you use Greek yogurt, make sure it’s full fat. Buttermilk: You can make your own buttermilk if you have milk and vinegar or lemon juice. Mix either the white vinegar or lemon juice into the milk and let sit for about 5 minutes. Add in recipe in place of regular buttermilk! 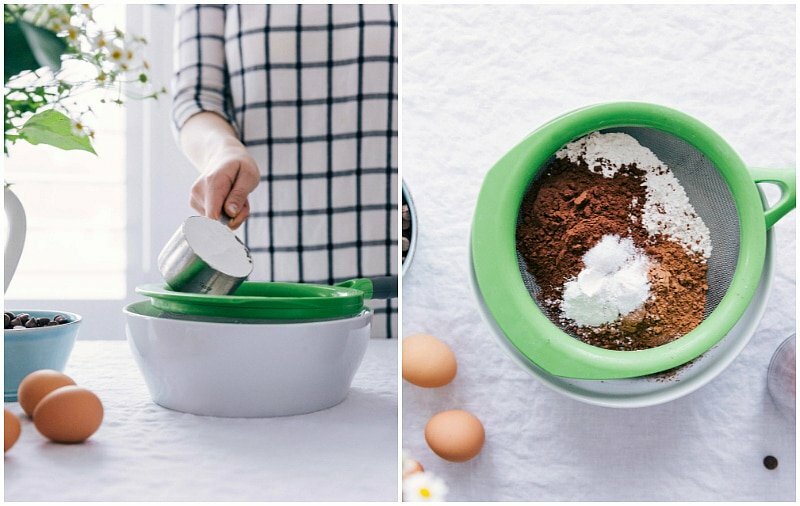 Cocoa Powder: I’ve tested this recipe with natural and dutch process cocoa powder — both work beautifully! While I’ll admit the dutch process is the BEST, natural cocoa powder works great in these muffins! Once you remove the muffins from the oven, let them sit in their muffin tin for a few minutes before removing to a wire rack to finish cooling. Remove the chocolate muffins after five to eight minutes to avoid the muffins getting soggy as they cool in the pan. Once completely cooled, store the muffins in an airtight container or bag at room temperature. These chocolate muffins are best fresh within 2-3 days. Yes! These freeze beautifully. Cool chocolate muffins completely before wrapping and freezing. To freeze: wrap completely in plastic wrap and then place in large freezer bags. To thaw: set out at room temperature, or heat frozen muffins in the microwave. 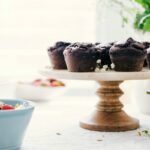 I hope you love these easy chocolate muffins! These Chocolate Muffins are a tried and tested bakery-style recipe! Learn the trick to moist, delicious, and flavorful chocolate muffins. Preheat the oven to 350 degrees F. Lightly grease (with cooking spray) and flour a 12-cup muffin tin and set aside. 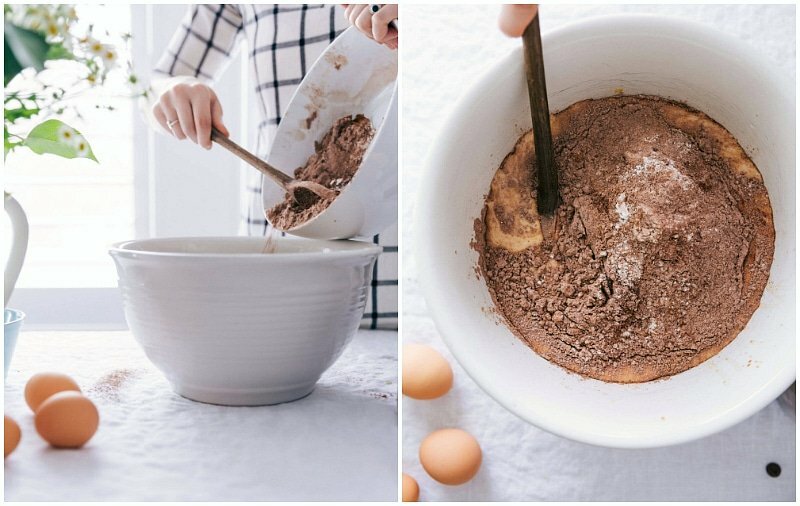 In a large bowl, sift together the flour (make sure to spoon and level your measurement so you don't pack in too much flour), dark cocoa powder, regular cocoa powder, baking soda, baking powder, and salt. Stir together and then add in the mini and regular chocolate chips. Stir to coat the chips in the dry ingredients (keeps them from sinking to the bottom). In another large bowl (or stand mixer with whisk attachment) beat the eggs on medium high speed. Slowly add in the white sugar and then brown sugar while continuing to beat. Beat until the mixture is pale and thickened, scraping the sides of the bowl as needed. Slowly stream in and beat the oil and then (melted and cooled) butter until completely combined. Beat in the sour cream (or yogurt), buttermilk, and vanilla extract until incorporated. Add the dry ingredients to the wet ingredients and fold in until JUST combined. You don't want to overmix here or you'll end up with dense muffins. Spoon the batter evenly into the prepared muffin tin, keeping the scoops mounded. Fill muffin cups a generous 3/4ths the way full. Bake for 15-21 minutes (watch carefully; it can vary depending on actual oven temperature, how full your muffin tin is filled, etc.) as soon as a toothpick comes out with moist crumbs, they are done baking. Remove and allow to cool in the muffin tin for 5-8 minutes before removing to a cooling rack to finish cooling. Once completely cooled, store the muffins in an airtight container or bag at room temperature. Best fresh within 2-3 days. 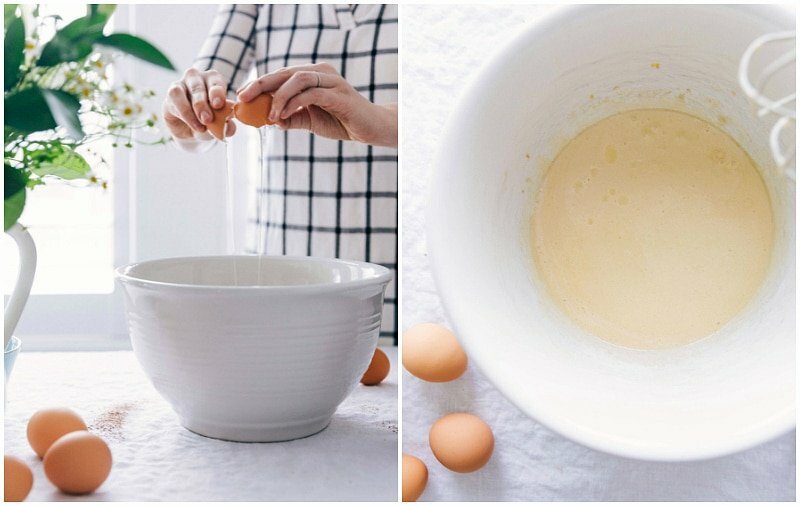 To make your own buttermilk: pour 3/4 cup of milk into a bowl, sir in 2 teaspoons of white vinegar or fresh lemon juice, mix either the white vinegar or lemon juice into the milk and let sit for about 5 minutes. Add in recipe in place of regular buttermilk! *These muffins have been tested with natural cocoa powder and dutch process cocoa powder. If using dutch process cocoa powder, use 1 cup total. While dutch process cocoa powder truly makes these the best, regular cocoa powder is delicious as well! Well, your “tweaking and working” was very successful. They smelled absolutely delicious while baking and taste fantastic! Yay!!! So happy to hear that! 🙂 Thanks for reporting back Lynn! I am a muffin junkie. I love all kinds of muffins. This recipe is now in my 5-star collection! One word for these: INCREDIBLE! I used paper muffin cups in my tins and after cooling thoroughly, they came out perfectly. I also got 24 beautiful muffins from this recipe. I kept some, froze some and gave some to family members. Thanks for a delicious recipe! Yay!! I am SO thrilled to hear that and so happy it made it to the 5-star collection 🙂 Thank you so much for the comment Maryellen! 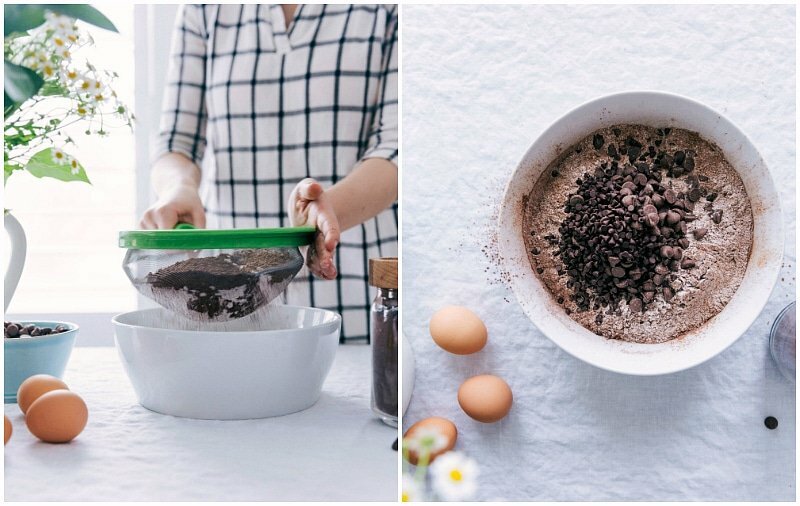 Just checking before I make these tomorrow – for the cocoa powder, we use a dark cocoa powder (like Hershey’s Special dark) & a regular cocoa powder (like natural Hershey’s ), or use 1 cup Dutch processed cocoa powder instead? Thank you. I am a little confused! Totally correct! 🙂 I prefer the 1 cup Dutch processed cocoa powder in these muffins but if you can’t access it, I’ve found mixing the two (dark and natural) is the next best thing! I made these for breakfast and my son was in heaven. He ate 4 in one sitting. I had to make the butter milk with lemon juice but they turned out amazing! So moist and tasty! I think they are better than Costco, not as dense. Thanks for sharing this recipe! !